IT gives me this error : ##### ERROR MESSAGE: SAM/BAM/CRAM file [email protected]01da01d appears to be using the wrong encoding for quality scores: we encountered an extremely high quality score of 65. Please see https://www.broadinstitute.org/gatk/guide?id=6470 for more details and options related to this error. Any IDea?? "this link does not take me to any place"
The link to Step-by-step tutorial(s), (howto) Perform local realignment around indels, is broken: https://www.broadinstitute.org/gatk/guide/article?id=2800 . Some other howto links also not working. Could you please fix it? Thanks. The link is in Best Practice -> Pre-processing -> Realign Indels. I suspect those are being fixed as we talk on the thread! As for the how to, here it is. This new article replaces the old article (2800). Yes this is actually fixed in web dev, and we'll be pushing the updates later this week following the 3.6 release (which is happening today). I was hoping you could advise how to resolve the 54bp deletion in the attached screen shot. This data is from a tumour-only amplicon experiment. It actually does get called with HaplotypeCaller but I understand it's not really suitable to use the local reassembly tool with low complexity data, is that correct? So I've been trying to force IR to resolve it by manipulating the LOD, greedy and max consensuses values but the gap wont open. I have checked the region is included in the interval file. Any thoughts or suggestions much appreciated. For tumor data, you should be using MuTect2. I have run indel realignment on whole genome data. After indel realignment I got an high frequency of deletions at the end of the reads (up to 0.16). 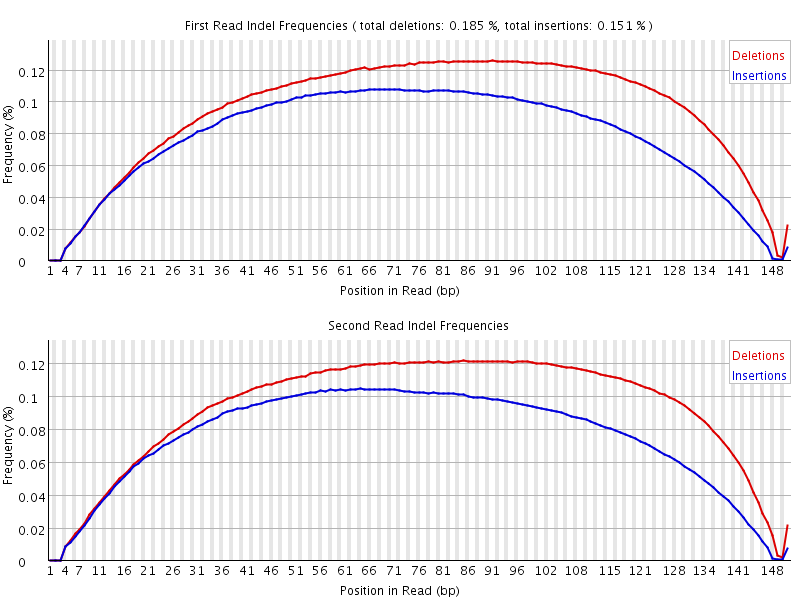 These high deletion frequencies at the end of the reads did not appear before running indel realignment. Is this normal? I have included plots of indel frequencies (after indel realignment and before indel realignment). Indeed, we expect a higher number of indels at the ends of reads. Have a look at the tool documentation and the Indel Realignment presentation here. To clarify, Indel Realignment enables you to identify indels that you would normally miss, especially at the ends of reads. This is because mappers tend to make mistakes at the ends of reads. So we do expect to see more indels at ends of reads after running Indel Realignment. However, we don't expect to see overall more indels covered only by ends of reads. If that is what you are seeing, this may actually be a sign of artifacts. Can you tell us more about the sequencing technology you used? Is it exome data? How much coverage do you have? In low coverage exome data, you could have more sites that are only covered by ends of reads, which skews the expectations. Have you done the variant calling and gotten the TiTv ratio? Thanks for your answer. 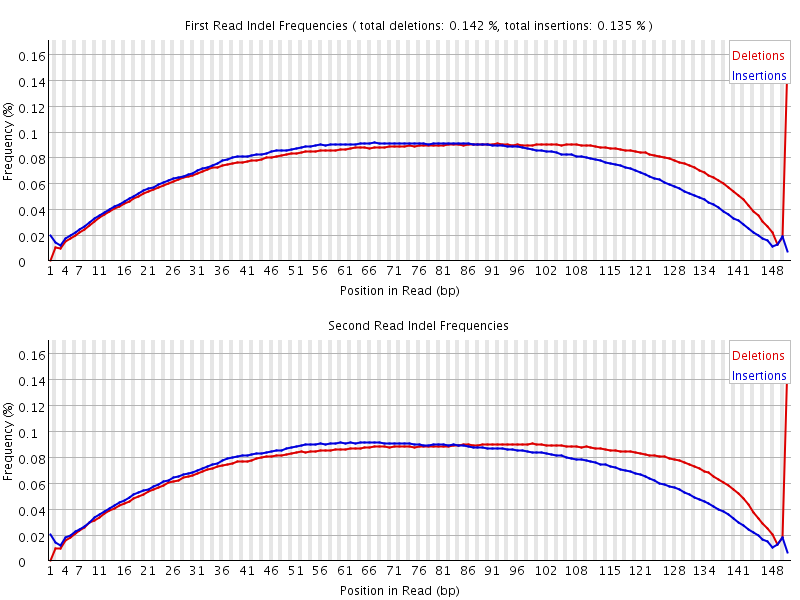 Yes I see overall more indels covered only by ends of reads. I am using PE150bp sequencing on an Illumina HiSeq XTen. It is whole genome re-sequencing. I am mapping against the reference genome of another (related) species. I have a mean coverage of 10x. I haven't done the variant calling, I'm using ANGSD for SNP calling and genotype likelihoods estimation as I have relatively low coverage data. That sounds like it could be an artifact, perhaps caused (or aggravated) by mapping against a different species. It's hard to say without a deeper analysis but I would definitely consider this a red flag. You'll need to evaluate your variant calling results carefully. Unfortunately since it is a use case that we have no experience with we can't help you beyond this. Thanks for your answer. I will look into the read alignment data.